“What is happening is that the pressure cooker in Syria has exploded and Europe has begun receiving shrapnel from the blast,” said Sandra Awad, who lives in Damascus where she works for Caritas Syria with those impoverished by the fighting. 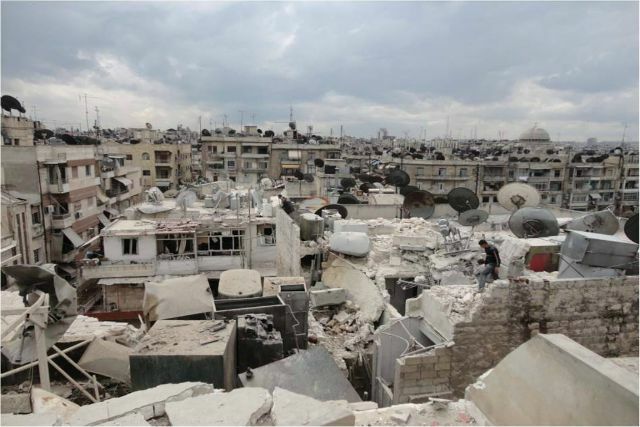 The conflict in Syria has left some 16 million people in need of humanitarian assistance. Half of them are children. Four million people and counting have fled the war and the country. Syrians flee to the neighbouring countries of Turkey, Jordan and Lebanon, where they live in camps, makeshift settlements, in half-built apartments or in small rented homes. There they lack access to adequate healthcare, education, jobs and shelter. Unable to work legally, they live in dire poverty. Abir and Tony left Syria for Lebanon at the start of the war in 2011. They live in Beirut where they receive healthcare support from Caritas for their three children. After years of exile, Tony does not have regular work and he worries about their future. “Here in Lebanon we are just surviving, not living,” he said. Host countries and aid agencies like Caritas are providing what they can. Survival is going to become much more difficult. A severe lack of funding means much of current aid programmes will be cut. There is a deficit of 80 percent on just food aid in 2015, meaning rations will be cut to $13 per person per month. And the numbers of people in need just grows. 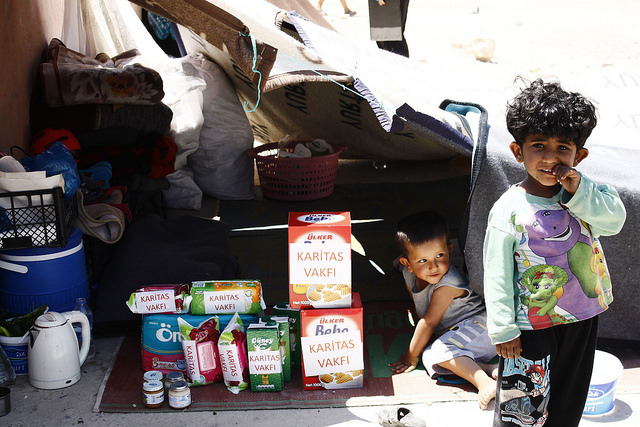 Turkey is now home to nearly 2 million Syrians, more than three times the number at the beginning of 2014. Refugees take a welcome shower amid the tourists on the Greek island of Kos. The hope of return is vanishing 5 years into a conflict that only gets worse. Alsama is a doctor. He left Syria two years ago for Turkey, but conditions there were bad and a return to Syria impossible. “We don’t want to waste any more time, we don’t want to waste our lives” he said. So he is travelling to Belgium through the “Western Balkan” route with his wife, three children under 6 and his mother. Their journey by foot, bus and boat is difficult, dangerous and expensive, from Turkey to Greece, to Macedonia, Serbia, Hungary and beyond. Crossing the water from Turkey to one of the Greek islands is precarious, made in makeshift plastic boats provided by traffickers. “You wouldn’t put a child on a boat unless it’s safer than your home. Imagine this desperation. We have nothing to lose,” said one refugee to a Caritas staff member. Over 2800 people have drowned in the Mediterranean this year, which is becoming a “vast cemetery” according to Pope Francis. “They arrive every day. Once they land, they go to a registration centre. They wait for 2-3 days. They sleep either inside the centre or outside in the open,” said Evelina Manola, a social worker for Caritas Greece helping with relief efforts on the islands. The situation of the new arrivals is dire with government capacity overstretched. Caritas Greece provides mats and sleeping bags on the islands of Chios, Lesbos, Kos and in Athens, as well food for children, hygiene items and essential information. “They get help from aid agencies, tourists and locals. In the park where many of them sleep, the cafe owner lets the refugees use the toilets and even has set up a shower,” Evelina Manola said. The refugees then go to Athens and onwards to other European countries by crossing the FYR of Macedonia. Caritas Greece staff distribute food among refugees crossing the border between Greece and Macedonia at the Idomeni crossing point. Conditions can be grim. 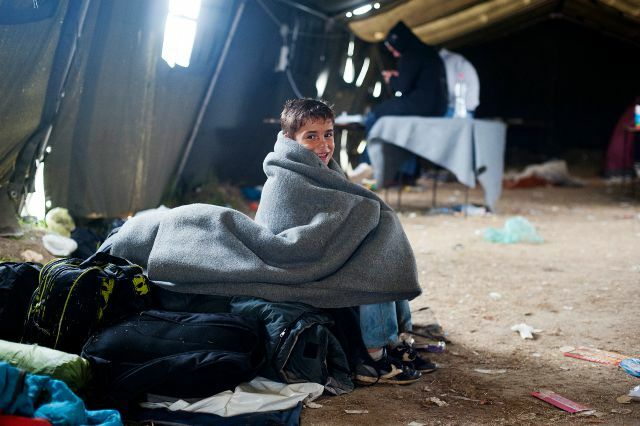 In bad weather, rain can turn the border transit area into a quagmire leaving the refugees soaked, cold and scared. The families arrive on the other side of the border in the Macedonian town of Gevgelija, they are tired and hungry. Caritas Macedonia volunteers have been providing water, food, hygiene kits and diapers. “It’s obvious that the migrants are exhausted through lack of sleep. 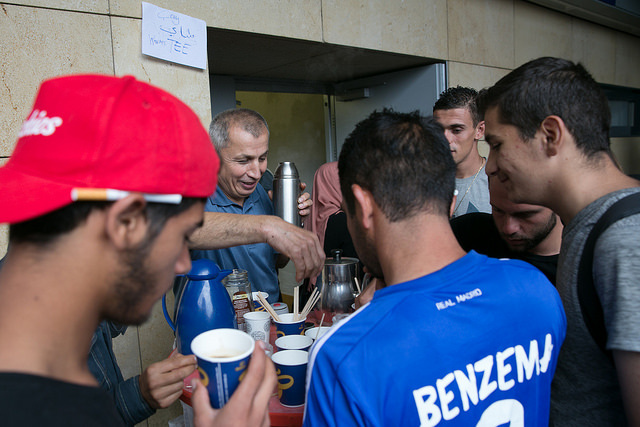 Their greatest needs – apart from a decent place to sleep – are water, food and hygiene materials,” said Msgr. Antun Cirimotic, secretary general of Caritas Macedonia. 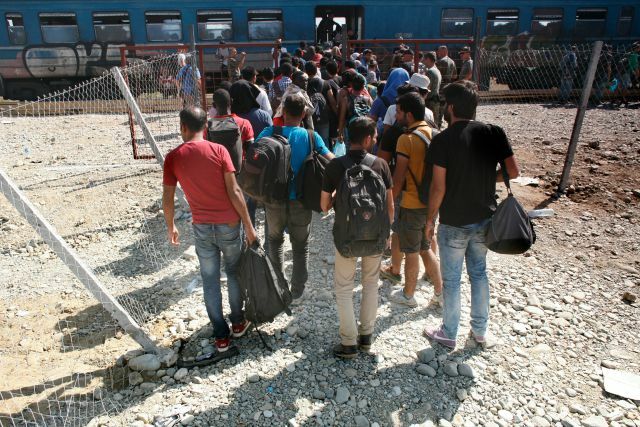 From Gevgelija, the migrants head for Serbia by train, taxi or bus. Across another border, refugees and migrants gather in the southern Serbian city of Preshevo, before going on to Belgrade, then the northern city of Subotica and the northern municipality of Kanjiza, near the Hungarian border. Fear and exhaustion are etched on to the faces of the families who have made it this far, but also hope. “Walking here is like walking from New York to Peru, but farther. We have made it,” said one of the refugees to a Caritas staff member. Caritas and its partners provide food, healthcare, hygiene kits, clothes and key information. The refugees and migrants stay for 3 or 4 days. They want to reach Hungary and the European Union. But crews have been working overtime on the Hungarian side of the border with Serbia to complete a 110 mile, 11.5 foot high, razor topped fence by 15 September. The fence, and a new law making illegally crossing the border a criminal offense, are part of a plan by the Hungarian government to stem the tide. But its continuing a strategy that has turned Europe into a fortress that has not so far worked. “People are like water. They will always find a way. You can either channel it, or you can build a wall and they will break through it,” said Kemal El Shairy. 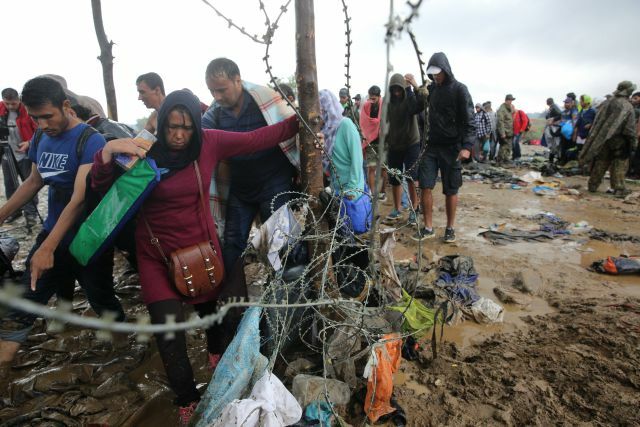 The refugees and migrants only want to pass through Hungary. They’re headed for Germany, Austria, Sweden and other countries in the EU. Caritas Austria president Dr. Michael Landau was at a Vienna railway station to receive the refugees. “The helpfulness of the people is overwhelming,” he said, adding that Europe doesn’t have a refugee crisis, it’s governments have a solidarity crisis. “I hope that this energy encourages Europe’s politicians to act,” he said. Over 380, 000 people have arrived by sea in Europe this year. About 50 percent are Syrians, the rest Iraqis, Afghans and other nationalities. 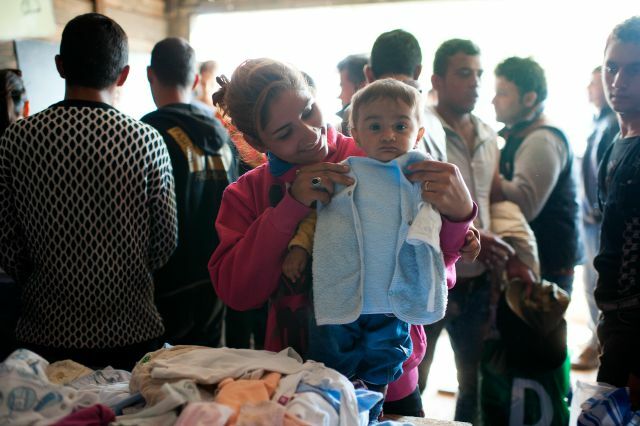 The number of Syrians who make it to Europe are only a fraction of the millions living in Lebanon, Turkey and Jordan. Lebanon has a population of 4 million people and is hosting 1 million Syrians (plus half a million Palestinians). Pope Francis has called on every parish in Europe to take a refugee family into their community. If evenly spread, the EU with its 500 million people, could accommodate many Syrian refugees without any demographic impact. Caritas is calling for safe and legal pathways to Europe, through policies like the recognition of humanitarian visas, and for help to those who do arrive to have access to jobs, schools and healthcare. Most importantly, Caritas is calling for a renewed diplomatic effort to end the conflict in Syria. “You might help some of these people who succeeded in arriving alive to your country with some clothes, food or even jobs and shelter. 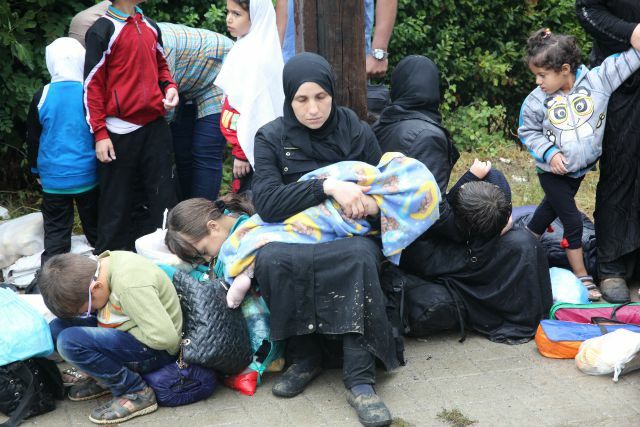 This will help reduce their suffering but it’s not a solution for us as Syrians,” said Sandra Awad of Caritas Syria.